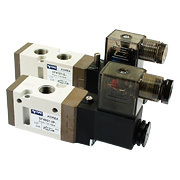 Very popular solenoid valves with functions 5/2, 5/3 and 3/2. Available thread sizes from G 1/8″ to G 1/2″. Valves from this series can be mounted on manifolds. All valves in our offer have have meet CE certification requirement. Flow from 200 l/min up to 3500 l/min (with pressure 5 bar, depending on valve size).